Last year, I had gone to 3 wedding parties over the span of a couple months. Wedding parties in Japan can range from a simple dinner party with no obligation to bring a gift to a full on wedding including the ceremony where a gift is mandatory. Weddings in Japan generally follow three forms. There is the shrine wedding, the church or western wedding, and then there is the after party. The main difference between a shrine wedding and a western style wedding is the setting of the formal ceremony itself. In Japan, a shrine wedding is becoming less and less popular with a church wedding becoming more popular. While a shrine and church weddings will have a banquet, recent times see many couples skip the ceremony to hold only a grand long banquet. After the major wedding parties, an after party will usually be held. The after party is a simple gathering of just the friends. It is generally regarded as the real party while the formal parties are more for show. A shrine wedding involves a shrine of course. Similar to a church wedding, the wedding is held in a religious building, in this case a Shinto shrine. The couple dress up in traditional Japanese kimono. Men wear a kimono which makes them resemble a samurai warrior who isn’t actually fighting. The men’s kimono is generally a black “jacket” with grey pants. 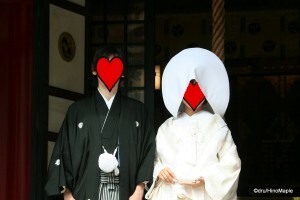 Women wear a white kimono with a special hat called the wataboushi. It is a circular hat that forms a white halo around the brides head. There are generally two types of wataboushi that I know of. One has a small slit in the front running vertically for her to look out while the other has a rounded opening with a red trim. The wataboushi with a small vertical slit may sound like it would be too small to see through but it is more than adequate for her to see, although her peripheral vision is somewhat impaired. Generally, a Shinto wedding is for family only. Extended family is sometimes included but friends are often not allowed. Some exceptions are made, just as a church wedding will allow Sikhs to enter the church with a turban, but if you are not christened into that religion, you cannot take part in specific aspects that are reserved for practicing members only. In a Shinto wedding, there are exceptions that can be made so that friends can also attend but it really depends on space within the shrine itself. As for the other guests, mothers often wear a black kimono and fathers wear a tuxedo. The tuxedo is sometimes adorned with tails as is the tradition for very formal settings. Other guests tend to just wear suits and dresses that can resemble an evening gown. The actual ceremony starts once everyone has gathered in the front courtyard, and of course after everyone takes some photos. Some weddings will have everyone prepare in a special hall adjacent to the shrine. This is where they may brief everyone on the customs of the ceremony, such as what to do and when as well as an introduction of both families. This is not always the case but it can happen. The parties then line up according to the bride and groom and proceed to the font to wash their hands. The bride and groom wash their hands first and are given paper to dry their hands. The guests then follow until everyone has washed their hands and they are ready to enter the shrine. Once inside the shrine, everyone takes a seat and the ceremony begins. The priest gives a short ceremonial blessing before the sake is poured for both the bride and groom. The ceremony differs a little but generally they have 3 small dishes of sake that they must drink from. One of the ceremonies I attended, they had to leave a little from which they collected it all into a final dish to drink from. My guess is that it is a symbol of coming together for the couple. After the couple drinks sake, there is sometimes a dance by the priestesses of the shrine and then all the guests drink sake. I was a little surprised to have water once, but that is okay. 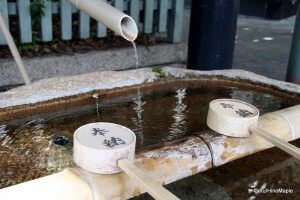 Drinking sake is all about purifying oneself and I think water makes no difference either. Afterwards, everyone heads out of the shrine and the bride and groom exit the shrine as husband and wife. Do note that while they may be married at the shrine, they are usually legally married much earlier. That ceremony is pretty boring and involves just paperwork at the local city hall. The Shinto ceremony itself usually lasts about 30 minutes depending on how much the couple decides to pay and how big the shrine is. 60 minutes would be considered a long ceremony though. After the ceremony, the guests usually head to the hall of the shrine. If the shrine specializes in weddings, the hall is well decorated with good catering. 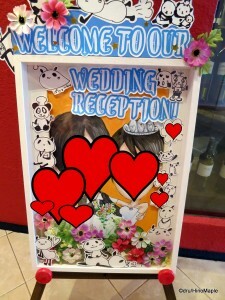 If the shrine is a little small, the couple will tend to book a separate restaurant or hotel for the banquet. Sometimes they may hold the Shinto ceremony in a hotel instead. The actual wedding reception is pretty standard, but there are a few differences. In a stereotypical wedding reception, the bride and groom are seated at a head table for two. They are the only ones at the front of the room and the typical wedding festivities occur. Dinner is served and the wedding families greet each of the tables. Both the bride and groom must go to each table during dinner to give a private toast. Once that is done, they can try to get one or two bites of food, but usually this is interrupted by guests taking photos with them and also with guests pouring copious amounts of alcohol into their cups. Usually this is a tradition but not always followed by all couples. Sometimes the couple doesn’t drink, so their cups will start to overflow with alcohol. In one wedding I went to, there was no head table. Rather, each table had a special table set for the bride and groom and they spent 10 minutes at each table to enjoy a dish with each group. It was a very good idea and the couple were able to eat their meal too. Of course there is the traditional cake cutting and feeding the first piece of cake to each other. In a traditional wedding reception, the guests have to entertain everyone. This can be anything from karaoke to magic tricks. It can be a stressful time for the guests who are asked to take part, but it is a part of the reception. It is also traditional for the parents to give a quick speech as well as both the bride and groom to give a speech to their parents. It is a touching time as always but the good thing is that the speeches tend to be shorter than western weddings, at least from my own personal experience. One of the worst speeches of the entire ceremony is done by the bosses of both the bride and the groom. Many managers hate to do it and even the wedding couple hate it but it is mandatory in a traditional Japanese wedding banquet. It is usually a short speech given before the first toast. During the wedding reception, it is also common for the couple to wear three outfits. They usually start with the traditional Japanese kimono. They then change into a tux and white wedding gown before finally changing into a suit or another tux and an evening gown. There is a third type of party is called the “nijikai”. Nijikai simply means the second meeting or gathering. It is more commonly translated as the after party. The after party (nijjikai) is usually associated with drinking parties rather than wedding ceremonies. On a couple’s wedding day, there is usually a formal dinner and then the crazy nijikai, or even a sanjikai, where you go to a third bar, to help unwind after the formal dinner. Think of it as a pub crawl. In a wedding, a nijikai is a very different beast. It is the party that the bride and groom want. It is very similar to a regular wedding reception except the couple usually only invite friends. Family usually don’t attend the nijikai and things get a little raucous during the nijikai. It is a time for friends to get together and celebrate the union of the bride and groom. There are no real rules on how a nijikai is held. Instead of a present for the bride and groom, it is customary for the guests to just pay an entry fee which covers the cost of the party itself. It can range from 5000-10,000 yen, but rarely goes over 10,000. The nijikai often runs the same course as a western wedding reception with an MC, various games, and sometimes a dance as well. It is where the couple can relax relative to the official ceremony with family. Unfortunately, it is common for both the bride and the groom to go hungry as they are busy with their guests taking photos and such. It is not always the case but it is often the case that they leave the party starving. The nijikai itself is often not the end as there is often several other parties afterwards. It can end in a big drunken mess but it can also be one of the biggest parties of a couple’s life. While it is becoming more and more common for a Japanese couple to have a western style wedding, for expats getting married, it is more common to see them have a traditional Japanese wedding. In a western wedding, it is common to bring a gift, but in Japan, the wedding reception itself requires a cash gift rather than a traditional physical gift. Registering with companies in order to prevent double gifting is not common as almost no one gives gifts other than cash. They often have small wedding envelopes that contain money. For distant friends, 10,000 is a normal gift, but for closer friends and co-workers, 30,000. Family, brothers or sisters, often have to give 50,000 and for parents, I heard 100,000 or more is often given. That really depends on the family. I am often surprised now when my friends back home say I gave too much money as a gift. I don’t feel like it is too much anymore as I am close friends with them. I am happy to keep the Japanese tradition and I will keep doing it for as long as I can imagine. The favour doesn’t go completely unreturned as when you leave the wedding reception you are often gifted with an expensive gift. These can range from a small snack and the famous catalogue. The catalogue is a thick book with information on gifts the bride and groom will give you once you have selected it. You typically get it delivered by mail and the couple pays for it later. Nijikai parties are often a lot better than a full wedding party. You are not expected to give a gift and you still come away with a small gift. The nijikai is often nice and relaxed and you can see more and more people drinking and having fun. Even the wedding couple enjoy it a lot more. Depending on the type of nijikai, there can be a second or third party after the nijikai. This can lead into a full day of drinking that leads to people stumbling home. It isn’t the worst thing in the world but it can be an interesting sight to see. This entry was posted in Culture and tagged gift, japan, Japan Wedding, Japanese wedding, Marriage, Nijikai, Shinto, Shinto Wedding, shrine, wedding, Wedding Reception by Dru. Bookmark the permalink. Somehow, I feel foreigners prefer Shinto style over chapel weddings. I immagine the amount of cash to give as gift is ritualized: at least one is not left with the agonizing doubt of giving too little if too much (assuming one knows the rules). The son of a friend of mine married a Chinese lady and they all went to rural china for the ceremony. It was quite complicated: they have to give a very substantial cash gift (determined after long negotiations) but the system was set in such a way that the money kept changing hands in between the two families until they got back almost all the money they gifted in the first place. The ritualized amount is really easy and I think it is a lot easier than western methods. I do find that the amount is a lot more than anyone back home really expects. Every time I gave what I thought was a simple gift, my friends said it was too much. Dunno what an average amount is for back home anymore. As for the Chinese one, I never heard that before, and I’m of Chinese descent. 🙂 I did hear of a new one in Japan. I forgot the name, but it is basically similar. They have an “engagement party” where they exchange money. Kind of like a dowry, but usually the money goes to the wedding itself. Sometimes you have to negotiate it, and from one of my student’s, it ruined her brother’s wedding to the point he is no longer getting married! Sometimes it is better to elope. Yes, that’s the tradition. The grooms family has to pay the brides family a substantial amount. The bride fam will return most of it to prove their sincerity .